We’d love your help. Let us know what’s wrong with this preview of The Tail of Emily Windsnap by Liz Kessler. To ask other readers questions about The Tail of Emily Windsnap, please sign up. What like top or bathing suit do Emily wear when she is transforming? Emily Windsnap’s life changes in a split second during swim practice. You see, she’s a mermaid. But she had no idea. And when she discovers the truth, she opens herself to a whole new world of uncertainties and secrets waiting to be discovered. Such as, where is her father? Why did he leave her? Was it even his choice? Emily is a lot like the heroine from HAVE YOU SEEN JESSICA JENKINS? from the same author. She’s energetic, curious, courageous and adventurous. They also have the same voice. I liked Emily Windsnap’s life changes in a split second during swim practice. I liked her of course. She’s a great kid whose life is complicated. I prefer that to a heroine with a seemingly perfect life. Boring and unrealistic. Challenges must be faced and Emily is just the right girl to spark a revolution. The world-building is extremely underdeveloped. So underdeveloped I could basically say that there isn’t any. We’ve been introduced to few mermaids and got to know only one. I hope the next books will show more of the mermaid’s life because fantasy books need showing, not simply telling. And structure obviously but that hasn't been a problem so far. It’s a charming book though. Predictable to the reader—they know more than the heroine at all times—which in this case is unfortunate, but once again I anticipate creativity and mystery in the sequels. It gave me the strength to love myself, and smile again, and it taught me to be brave and hope for the best. This review has been hidden because it contains spoilers. To view it, click here. The plot idea is interesting - a seventh grade girl finds out she's a mermaid when her legs become a tail the first time she's submerged in water for swim lessons - but the writing itself is weak (unless you like books with manipulative "you aren't my friend unless you do this" girl talk). The speech Emily gives Neptune, the sea god, at the end is suppose to be a moving defense of love and families but came across as trite. Neptune, although he does the right thing in the end, was a disappointme The plot idea is interesting - a seventh grade girl finds out she's a mermaid when her legs become a tail the first time she's submerged in water for swim lessons - but the writing itself is weak (unless you like books with manipulative "you aren't my friend unless you do this" girl talk). The speech Emily gives Neptune, the sea god, at the end is suppose to be a moving defense of love and families but came across as trite. Neptune, although he does the right thing in the end, was a disappointment too. I guess I expect more from my gods than individuals who get blustery over being addressed as "sir". I understand that the author might be trying to show his imperfections, but how can someone be a god, when they're just as petulant as the seventh grader who's lecturing them? The final straw for me was when the author described Emily's height. Would it really have been THAT hard for the author to look at a measuring tape before describing their 7th grade heroine as three feet eight inches tall? My first graders are taller than that! It's amazing how a book can immediately transport you back to childhood. A fascinating book about a girl who discovers herself is a mermaid, and she explores the secrets of her life. 2. Believe it or not, one of the most normal characters in this book was “Mystic Millie”, and while it was pretty clear that all her stuff was fake, there were many mentions of auras, reflexology, etc., and a “hypnosis” session on the main character. 3. The main character went around her mom a lot during the story. Understandable in this case, but not my favorite theme. 1. The mermaid culture was pretty cool. :D That’s pretty much what I read the book for, and it definitely didn’t disappoint! Their underground caverns, the descriptions of swimming, even Neptune’s court were all fantastic. 2. “Pretty swishy” is my new favorite slang term for something being “cool”. 5. Shona and Emily’s friendship was really fun. 6. Emily’s dad was the most adorabling, sad, sweet, loving poet ever. I believe the scientific term for that is “a cinnamon roll”. 7. Mom and Emily’s picnic. They had a nice relationship even though it sometimes had its problems. Just a note, there were two blasphemies, some use of redacted language, and the word “wicked” was used to mean “cool”. Also, there was talk of sirens hypnotizing sailors. Very, very cute book about a girl who, at the age of twelve, has never been fully immersed in water. Although she lives on a house boat, her mother is deathly afraid of water so Emily's never been swimming. The boat is so small there's no room for a bathtub. When she finally takes swimming lessons in school, low and behold she discovers she's a mermaid. Well, sort of...she's got legs when she's out of water, and a tail when she's immersed in water. Emily is especially endearing because she's alwa Very, very cute book about a girl who, at the age of twelve, has never been fully immersed in water. Although she lives on a house boat, her mother is deathly afraid of water so Emily's never been swimming. The boat is so small there's no room for a bathtub. When she finally takes swimming lessons in school, low and behold she discovers she's a mermaid. Well, sort of...she's got legs when she's out of water, and a tail when she's immersed in water. Emily is especially endearing because she's always been a bit of an outsider. She doesn't have a best friend, and doesn't quite fit in with the girls in her school. When she finally finds a mermaid best friend it's so endearing it's almost embarassing. There's a pretty sappy, unrealistic ending, but what are you gonna do? I mean, she's a mermaid after all. You don't read a girly mermaid book without expecting some unrealistic sappy-ness. I first read this book in 5th grade and ended up re-reading it and buying the box set in high school for the nostalgia. As a children's book I really loved it so much and it just fed my still on-going dream of being a mermaid. Have you ever wanted to be a mermaid? Well, this will be the perfect book for you. This book talks all about mermaids and a mermaid’s life. I personally really like mermaids and that is why I like this book. This follows the adventures of Emily Windsnap as she discovers she is a mermaid. Emily Windsnap is the main character who does not know she is a mermaid. When she has her first swimming lesson, her legs stick together and feel weird, which makes her think something is happening. It turns out Have you ever wanted to be a mermaid? Well, this will be the perfect book for you. This book talks all about mermaids and a mermaid’s life. I personally really like mermaids and that is why I like this book. This follows the adventures of Emily Windsnap as she discovers she is a mermaid. Emily Windsnap is the main character who does not know she is a mermaid. When she has her first swimming lesson, her legs stick together and feel weird, which makes her think something is happening. It turns out that everytime she gets into the water she gets a tail and fin. This leads her to discovery that she is a mermaid. The second main character is Emily’s mom who also does not know that Emily is a mermaid. The genre of the book is fiction. It is fiction because it talks all about mermaids. I think that people who like fiction books and fantasy creatures would like this book. If you like mermaids then this would be a great book for you. If mermaids and mermen were real, then they would like this book as well. The purpose of the work is to get people to be more interested in mermaids if they are not already. Without giving away the whole story I can say the main characters and main points. This will help you readers get your interest in mermaids.The text does definitely reach to the intended audience because it was made for all people. All people would like this book because it is not worded to easy or too hard for them to understand. It may be worded too easily for grown adults, but who does not like mermaids? Wowser. I stumbled upon this book at Barnes and Noble yesterday and have been quickly turning pages ever since. Hold on...another British author who writes youth fiction that is both fun AND intelligent? How have I missed these books by Liz Kessler? This, the first Emily Windsnap book, was published a decade ago. While this book was written for children, it captivated this grown-up to the point of needing to know NOW. It is a rare book that delivers both suspense and satisfaction in this day and Wowser. I stumbled upon this book at Barnes and Noble yesterday and have been quickly turning pages ever since. Hold on...another British author who writes youth fiction that is both fun AND intelligent? How have I missed these books by Liz Kessler? This, the first Emily Windsnap book, was published a decade ago. While this book was written for children, it captivated this grown-up to the point of needing to know NOW. It is a rare book that delivers both suspense and satisfaction in this day and time when making a statement or being artistically significant seems to be more important to authors than entertainment. Don't get me wrong, this story delivers some important lessons, but not at the expense of the savory enchantment that fills its pages. If you have reading girls in your life, they will love this book and be begging you for the sequels. If you have little girls who are not yet ready for chapter books, this would be a read aloud experience to cherish. If you have reluctant readers who need encouragement, this might just be the one that hooks them. "Hooks" is the perfect word for this book about the sea and life therein. I won't spoil the story be telling you more. Simply put: if the pieces of your life do not quite seem to fit, there might be more to the picture. Recommends it for: Absolutely nobody! Read this book to my 7 year old daughter. Had been really looking forward to reading it, & ordered it from the library, as there are follow up novels to this which we were hoping to enjoy too. I am giving this book allowances for the fact that it is a children's book, and as such is geared towards and written for a young, unsophisticated audience. It was bad, bad, bad. I was absolutely bored to tears with the dreary, thoroughly unlikeable, two dimensional characters, and the erratic and moron Read this book to my 7 year old daughter. Had been really looking forward to reading it, & ordered it from the library, as there are follow up novels to this which we were hoping to enjoy too. I am giving this book allowances for the fact that it is a children's book, and as such is geared towards and written for a young, unsophisticated audience. It was bad, bad, bad. I was absolutely bored to tears with the dreary, thoroughly unlikeable, two dimensional characters, and the erratic and moronic behaviour of the main character, Emily. The plot was repetitive, flat and ridiculous and the whole process of plodding through this book was draining and exhausting. I have never been so glad to get to the end of a book. My daughter didn't enjoy this book either, even though I tried to keep my irritation and boredom to myself. Our tastes veer towards the more dark, weird and funny. 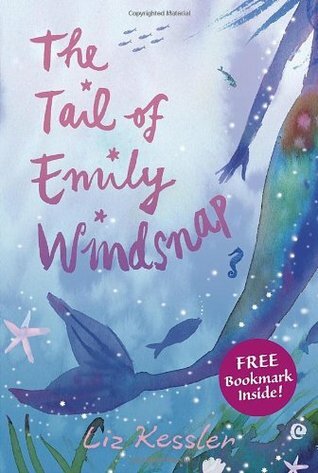 The Tail of Emily Windsnap is an enchanting story about a girl, Emily, who is part mermaid. She does not realize that she is different until she takes a swim class in seventh grade. When she gets into the water she grows a tail and becomes a mermaid. Emily tries to understand why she is like this as she swims through the ocean. Luckily she meets a good friend underwater, and starts to explore her past. Emily and her friend work together to solve her family mysteries while building their friendsh The Tail of Emily Windsnap is an enchanting story about a girl, Emily, who is part mermaid. She does not realize that she is different until she takes a swim class in seventh grade. When she gets into the water she grows a tail and becomes a mermaid. Emily tries to understand why she is like this as she swims through the ocean. Luckily she meets a good friend underwater, and starts to explore her past. Emily and her friend work together to solve her family mysteries while building their friendship, and trying to stay away from the evil dictator of the mer-world. I really liked this book because it kind of expresses how people feel while going through change even if it isn't as dramatic. This book shows that even after life changing events things can still turn out for the better. Also it describes how people this age handle things. Die Geschichte ist sehr unterhaltsam und beschreibt die Entwicklung von Emily zur Meerjungfrau sehr gut, denn zu Beginn weiß sie dies noch nicht. Glücklicherweise wird nicht zu lange drumherum geredet und Emily entdeckt sehr schnell was mit ihr los. Emily ist ein sehr sympathisches Mädchen und hatte sehr viel Spaß sie bei ihren Entdeckungen in der Meereswelt zu begleiten. Oh my gosh, I forgot how much I loved this book! I think I was... 13(?) when I read this last? I'd planned on rereading and finishing the series at some point, but when I got approved for the 8th (8th!!) book in the series on Netgalley, the entire series got bumped to the very top of my TBR, haha. This book is filled with tabs - mostly talking about things I love. It was such a fun, quick read and I'm so excited to read the rest of the books this month! Emily's adventure takes off from there with the exciting, fascinating discovery of the world of merfolk and the mystery that starts with her mom's dream and strange forgetfulness. And her overwhelming need to find out why her dad left. All these propel the reader along like a strong swish from Emily's tail. Liz Kessler builds a magical fantasy world that is very visual and clever. Who wouldn't rather go to these classes? Beauty and Deportment, Diving and Dance and to learn about shipwrecks in History class. Kessler hints at a unique history between the merfolk and the humans which will be fun to explore in upcoming books. This is entertaining enough for adults and children and a wonderful read to share. Emily sneaks off without her mom's consent and pushes her new friend to help her obtain her goals. Consideration needs to be given as to what compels her to do these things and could offer up discussion about whether the end justifies the means. Emily does have a loving relationship with her mother and that love is part of what drives her. Through Emily the reader gets the message to be comfortable with who you are and not to worry about what others say about you. I would recommend it for tweens on up through every generation. As Emily's new best friend, Shona, siren in training would say. Sharks! This is a swishy good tail and tale, that will leave you flipping fins until you read the next one. No es un libro de esos que a uno le cambian la vida, pero es bueno en el sentido de que se amolda a lo que pretende ser. Es una novela fantástica y para chicos de 8 a 12 años. Tiene vocabulario sencillo pero no está forzado ni trata al lector como a un idiota (que a veces pasa en libros para estas edades). Tiene un lindo mensaje, una aventura atrapante (aunque todo es muy predecible) y se lee rápido. Sep, es ideal para los lectores jóvenes. Esta es una muy buena novela para el público de la edad m No es un libro de esos que a uno le cambian la vida, pero es bueno en el sentido de que se amolda a lo que pretende ser. The Tail of Emily Windsnap is a great fantasy book about a 12 - year - old girl discovering who she is. All of her life Emily has stayed away from oceans and pools, thanks to her mother's warning of water being dangerous and scary. Finally, in her PE swim class, Emily is forced to swim and learns she is part mermaid. She doesn't tell anyone and quickly gets out of the water before any of her classmates can notice her long, beautiful tail. After many nights of sneaking out of her house, she disco The Tail of Emily Windsnap is a great fantasy book about a 12 - year - old girl discovering who she is. All of her life Emily has stayed away from oceans and pools, thanks to her mother's warning of water being dangerous and scary. Finally, in her PE swim class, Emily is forced to swim and learns she is part mermaid. She doesn't tell anyone and quickly gets out of the water before any of her classmates can notice her long, beautiful tail. After many nights of sneaking out of her house, she discovers an entire mermaid world near where her and her mother live. Upon this discovery, Emily bravely fights through battles to find out more about how she became a mermaid and about her family's background. The book is fast-paced and a little mysterious at times. I enjoyed it a lot because it keeps the reader engaged and curious. A young girl finds out the truth about her father, whom she hasn't even met. Very original plot, isn't it? The action is predictable and even mawkish, especially at the end. I expected an interesting construction of the world ruled by mermaids, but it was described superficially - the colours and shapes of fish and seaweeds was the main thing that we know about the place of the action. Some elements are also completely naive - for example, how could laptops work under water? Moreover, how coul A young girl finds out the truth about her father, whom she hasn't even met. Very original plot, isn't it? The action is predictable and even mawkish, especially at the end. I expected an interesting construction of the world ruled by mermaids, but it was described superficially - the colours and shapes of fish and seaweeds was the main thing that we know about the place of the action. Some elements are also completely naive - for example, how could laptops work under water? Moreover, how could they have their own RADIO, which cannot be listened by ordinary people? The Tale of Emily Windsnap is about a girl named Emily. She lives with her mom in a small house boat. Her mom and dad divorced a couple years ago when she was very little. Emily has always liked to swim, but her mom never let her. One day she took a swim lesson at her school and something very strange happend when she got into the water. A couple days after she swam she found out that she was half human half mermaid. I give this book 4 stars because it was a really interesting book and it's ver The Tale of Emily Windsnap is about a girl named Emily. She lives with her mom in a small house boat. Her mom and dad divorced a couple years ago when she was very little. Emily has always liked to swim, but her mom never let her. One day she took a swim lesson at her school and something very strange happend when she got into the water. A couple days after she swam she found out that she was half human half mermaid. Girl discovers she turns into a mermaid in water. Fine as it goes, but I wish the mermaid society had been a *little* more imaginative. Basically, it's exactly the same as human society: kids go to school, there are shops, government, courts and jail, etc. Even the author seemed to forget they were underwater (as when a mermaid pulls out a hankie to wipe away a tear.) Just disappointing. My daughter was given this as a Birthday gift and we just finished reading together as our before bed chapter book. It was very enjoyable for me as well as for her -- a good mystery and well written too. It's always great when we find a book we both enjoy and that is appropriate for both kids and adults. This is a really really good book! I brought this book along with me even when i went to Korea!! (and I live in Malaysia). Emily, a half-mermaid, tries to save her father imprisoned for having a relationship with her mother. and in the end, the happy family were together again. it was good nothing compared to any of the twilight books but still realy good! I think that this book could be better but the series is amazing my favorite book is Emily windsnap and the monster of the deep!!!!!!!! I loved this book as a child, I found Emily relatable, I loved reading about her adventures and she was a rock for me when I was 13 because I'd quite abruptly ended up without a close circle of friends at the time. However, when I picked it back up last week, I breezed through it in a couple of hours, which would be great if Emily wasn't tedious to read about. I'll admit, I don't like listening to 12/13 year olds bemoan their life and how the world is against them, so reading about it in a book I loved this book as a child, I found Emily relatable, I loved reading about her adventures and she was a rock for me when I was 13 because I'd quite abruptly ended up without a close circle of friends at the time. However, when I picked it back up last week, I breezed through it in a couple of hours, which would be great if Emily wasn't tedious to read about. I'll admit, I don't like listening to 12/13 year olds bemoan their life and how the world is against them, so reading about it in a book wasn't really my cup of tea. With that in mind, this book is fantastic for children because they'll think Emily understands them, especially the ones that are loners. Each character is unique, which make the story so much more enjoyable: Shona is a full time mermaid who finds solace in Emily; Emily's mother, Mary P, kind of floats through her life, which isn't to say she isn't a good mother but she's rather quiet when it comes to important situations; Millie is the resident psychic, she's my favourite character to be honest because she's just so peculiar and eccentric, she reminded me of my own mother. What's even more interesting is we only get Emily's POV, which is very biased, so the characters might not even be like this at all. It's always interesting to see how a characters are perceived by other characters. One of the best examples of this here is King Neptune whom I found very annoying, and childish, which doesn't seem consistent with the respect he's garnered in his court. I'll be very interested to see if this changes in later books. Liz Kessler is the author of three novels about Philippa Fisher as well as the NEW YORK TIMES best-selling Emily Windsnap series. She lives in Manchester, England.